This luxurious intelligent housing focuses on superb comfort conditions obtaining at the same time it promotes the struggle to prevent the gradual increase in the concentrations of contaminants in the environment; systematic physical degradation of nature and contribute to reduce the conditions that have systematically weakened the ability of a large number of people to meet their basic human needs. 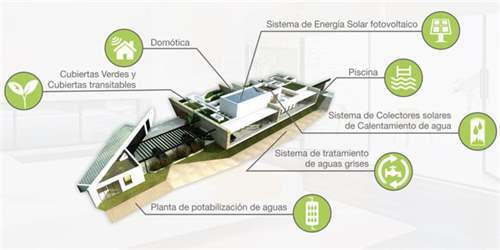 It is a benchmark for sustainable development in the region being currently the first and only project to which the USGBC (United States Green Building Council) has been awarded the certificate "LEED FOR HOMES – gold" in Latin America. 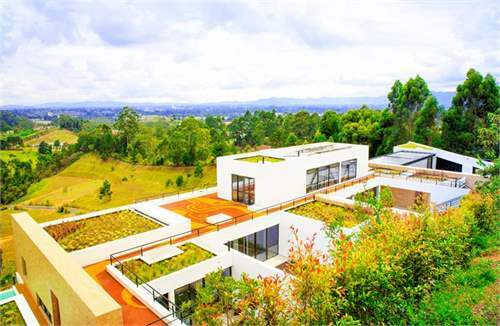 The property is located in Rionegro, Colombia, South America. It is enclosed in a suburban area of the Western Andean system Colombian mountain 17 kilometers east of Medellin, the second city of Colombia, near the international airport in Rionegro. It has one of the arguably most beautiful landscapes of the country. Regardless of its suburban setting, the project is linked to an exceptional variety of facilities, as the first level of complexity services of health, shopping malls, family parks, entertainment venues and golf courses, which provides access to a lot of basic and complex services. This location influenced the architectural approach to the interaction between the element and its environment through clean spaces that allow search of light, ventilation and views that merge with the improvement of the occupants experience and comfort landscape. 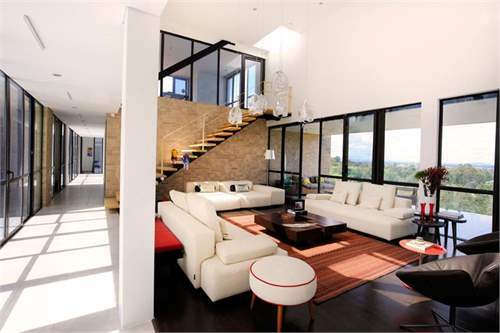 Among the main features are: this establishment 48437 square feet includes a 19375 square feet floor area House. 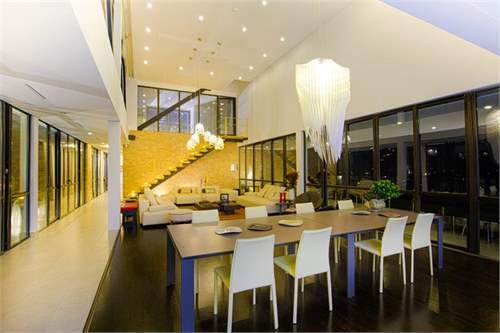 It has a grand entrance to a spacious living and dining room double height with a comprehensive approach that can connect this space with a beautiful courtyard entrance and a very large free floor balcony airy, dedicated to the impressive natural landscape view. Literally, with a touch of a button on your Smartphone can block the doors, control the weather houses, control lights, its high-tech audio system control and control of your alarm system. These are the built-in features that today's luxury homes require. Characteristics of improved kitchen aesthetic innovation, coordination without end and fantastic new textures. Good taste and values consistent with the living and the concept of fine dining; This Italian product has a design language to interpret the trend today to join the kitchen and living room, kitchen and dining room. 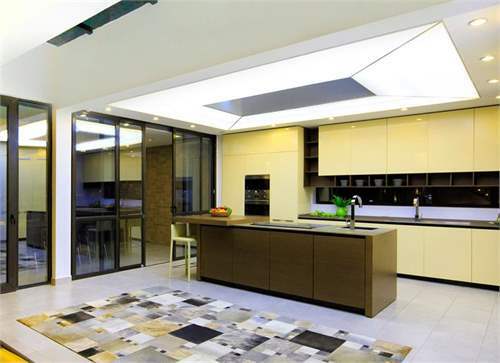 High energy efficient Smeg appliances complete this beautiful area in a respectful way of the environment. Kitchen outdoor and pool, the main outdoor kitchen amenities include a built-in gas Grill, a sink and a stainless food preparation area. Be a natural space in the courtyard for entertainment and enjoyment of the incredible Land scape. A stunning heated pool awaits. Relax in the comfortable chairs, enjoy a refreshing swim or calm your stress. with an automatic cover and change of bath, combines a lot of privacy with magnificent views. Within a 10 minute walk from nearby facilities and services include: 18-hole golf course, club house, gym, Center of shopping, hospitals in high-level, international airport, fine restaurants, recreation centers, tennis courts and much more. A sumptuous bath in their day to day lives through master bathroom spa - like in their own home. This includes showers huge walk in with high-efficiency shower, toilets smart, Towel heaters, and of course a good bath of immersion, where one can escape from the stresses of life. Luxury should not stop when one crosses the threshold of its biggest private sanctuary - the bedroom. So many hours of our lives are spent in the bedroom. The master bedroom is a large open space with space for a huge bed and plenty of seating areas with a magnificent view. First-class technology is also included in this private abode. With integrated automation for shades of lighting, security systems and remote control window. A dressing room with superlative storage space... An extension of the room is the costume. A high priority for women is a place to store and display your most valuable purchases such as shoes and handbags. It is a large separate room to dress and show its high-end garments. This area of the House has a large Wall shelves lined Italian, racks to display shoes, handbags and neckties, and of course a lot of lighting and plenty of space for mirrors to model the chosen outfit or apply makeup. When it comes to design, provided its roof can withstand the load of furniture, pedestrian traffic, and plantation - the sky is the limit. Acoording to Kathleen Peddicord. Publishing live and invest overseas, in his article the 5 Top overseas markets property to 2016 Colombia, and in particular Medellin is the number one destination as it says one of my favorite cities in the world in a country whose prospects I'm more bullish on all the time, Medellin is the best choice at this time for both investment and lifestyle. Contact Us, we have been in the Real Estate 20 years bussines helping clients buy their dream home. This property is a Bungalow for sale. 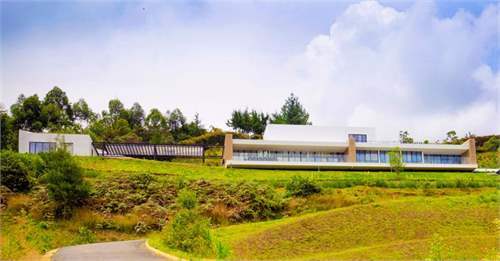 This property is located in: Rionegro (Antioquia, Colombia).